I am really looking forward to our site visit with a Backyard Habitat technician this Wednesday morning! Our new property is a blank slate, for the most part, and I have been in the process of transplanting potted plants into the soil (finally!) after many years of container gardening as a renter. 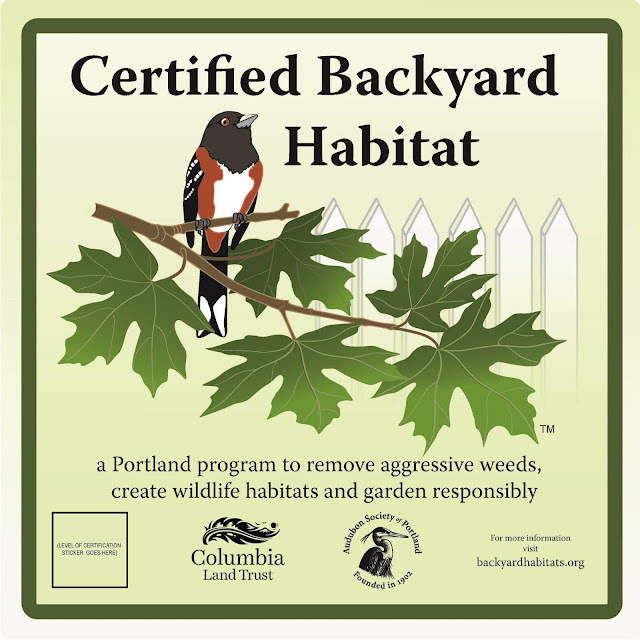 I've always been curious about the certification program created by Audubon Society of Portland and Columbia Land Trust, seeing the sign you see above posted in various gardens around town. Now that I'm starting on a brand new garden, it was important to me to sign up and get the certification process started so I can be connected to resources and support in creating a healthy habitat for the bees, birds, and plants (hopefully, many native!). There are certain certification criteria you work on over about a year before one usually receives the silver certification. The certification is good for up to three years, and there are various degrees of certification you can receive (silver, gold, and platinum). The five elements of a backyard habitat that are addressed prior to certification are removing invasive weeds, growing native plants (not exclusively), pesticide reduction, stormwater management, and wildlife stewardship. If you click above to the criteria, you will see that it is not too hard, and many of us may already be doing the important things that the program is trying to promote. I'm excited to work together with a technician on ideas for making our yard more of a supportive haven for native species and wildlife. Following Wednesday's site assessment, I will be receiving a report with plant recommendations and steps to certification. Any invasive species will be identified, and I will be given support and resources to reach my goals. The resources includes discounts on native plants in the area! I have already ordered 15 native plants from East Multnomah Soil and Water Conservation District (EMSWCD), which will arrive in mid-February. Am excited to grow my first red flowering currants (Ribes sanguineum) and golden currants (Ribes aureum), as well as mockorange (Philadelphus lewisii)! Very exciting! I already have a Ninebark Pacific (Physocarpus capitatus) and Snowberry (Symphoricarpos albus) in the yard already, both of which are natives. I can't say enough about this certification program--check it out! Oh, and check out the Grow Smart, Grow Safe app that guides you to safer products for gardening. In the end, I hope to have learned a lot, encouraged other neighbors and friends to create their own safer, more healthy and supportive, backyard habitats, and proudly display my beautiful sign after a lot of fun and creative work!